From nowhere hurtled that black death car. And from nowhere came its grisly occupants. They were not of the earth, for their human flesh was immune to bullets. They were not of the grave, for they manned the wheel and a blasting machine gun... Secret Agent "X" made a desperate maneuver to block their invasion of the land of the living. And in that weird terror trap, he came face to face with a man he knew - a man he knew had died five years ago. Reading Paul Chadwick's weird detective series WADE HAMMOND has got me on a Chadwick kick. He has a clean style of writing that gets to the point by not being too florid, using terse and short sentence structure that keeps things moving, but still holds a lot of descriptive elements that makes this a very visually-inspiring prose. His story telling goes down easy and can have a good pay off. Some of his earlier short stories can have a nice setup but tend to peter out at the climax, but others are tight and brisk all the way through. I've been reading reviews of the Secret Agent X pulps and have decided to give them a try. If you would like a good look at select reviews of the series I highly suggest heading over to Pulpfan and as always over at Doc Herme's place. I've ordered the first volume of the Altus Press collection which I believe is attempting to reprint the entire series in 9 volumes. The first volume includes Chadwick's The Torture Trust, The Spectral Strangler, The Death-Torch Terror and Ambassador of Doom. Right now I'm reading one of Emile C. Tepperman's contributions to the series, The Murder Monsters. From what I've read so far, Secret Agent X seems to be an ex spy who after WWI is now financed by a star chamber of benovolent secret benefactors who want to stem the tide of a post war crime wave. The criminals that "X" fights are cut from the cloth of Norvell Page's THE SPIDER, being a rogues gallery of rampaging psychopaths using robots, monsters and costumed henchmen to wreck havoc across the country. The difference is that "X" usually has a protective layer of anonymity to shield him from crooks and cops alike using a broad assortment of expert makeups to disguise himself. Also the prose of "X" doesn't get quite as fever-dream and desperately hopeless like The Spider does, but keeps and even keel on the overall emotional structure of the stories. 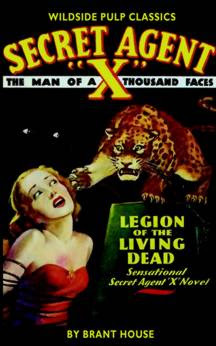 Today's experiment is a later tale in the series written by Chadwick called Legion of the Living Dead. This has great reviews from both Doc Hermes and Pulpfan. This is in print from Wildside Press so if you want a reading copy you might want to order it from them. So let's give it a spin at Archive.org! This goes under the "why didn't I know about this before" heading. 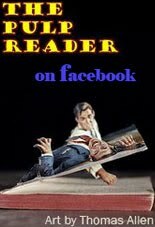 Dial P for Pulp is a website that has brought news and reviews and some audiobook readings to its listeners since mid-2007. There's a good mix of stuff in each podcast and there's 10 episodes so far, so you might want to check it out. What are you waiting for? Go download and listen!